The Model 200 "LRT" is a compact, 2" diameter x 1.950", depth (50.8 x 49.78), cost-effective solution to difficult application problems. A neutral (center-off) switch is available in either single-pole single-throw (SPST) or single-pole double-throw (SPDT) configurations. An optional double-upper switch, non-timed "hold" position, and "positive stop" for one-way setting, are also available. Two-way (bi-directional) setting is standard. The Model 218 "PBLRT" version with a second cam and switch assembly, resulting in a total depth of 2.380" (60.45), is also available. The second switch assembly is isolated and features the same configuration and options as on the basic LRT. With double the circuits, the PBLRT is able to economically meet more complex application requirements.The Model 200 electromechanical timer has versatile applications for commercial food service equipment, laboratory equipment, and more. 15 amp 125/250 VAC; 1/2 HP, 125/250 VAC. Many standard cycle times and operating intervals available. 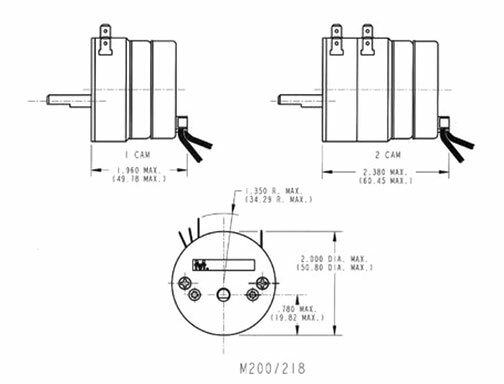 Permanent magnet, 24 VAC, 115 VAC or 230 VAC nominal voltage inputs at 50 Hz, 60 Hz or 50/60 Hz. Motor leads 4"' (101.6) long with .187" ( 4.75) stripped ends standard. Quick connect terminals optional. .248" (6.3) diameter shaft. Available in many configurations. Either 3/8 (9.53)-32 threaded bushing with .180" (4.57) diameter anti-rotation boss or tapped aluminium inserts for #4-40, #5-40 or #6-32 threaded screws. Commercial food service equipment, laboratory equipment, room air conditioners, counter top appliances, beauty equipment.